Fact Sheet: DNA-RNA-Protein – microBEnet: the microbiology of the Built Environment network. DNA is the genetic material of all cellular organisms. RNA functions as an information carrier or “messenger”. Ribosomal RNA (rRNA) is involved in protein synthesis. 1. DNA is the genetic material of all cellular organisms. 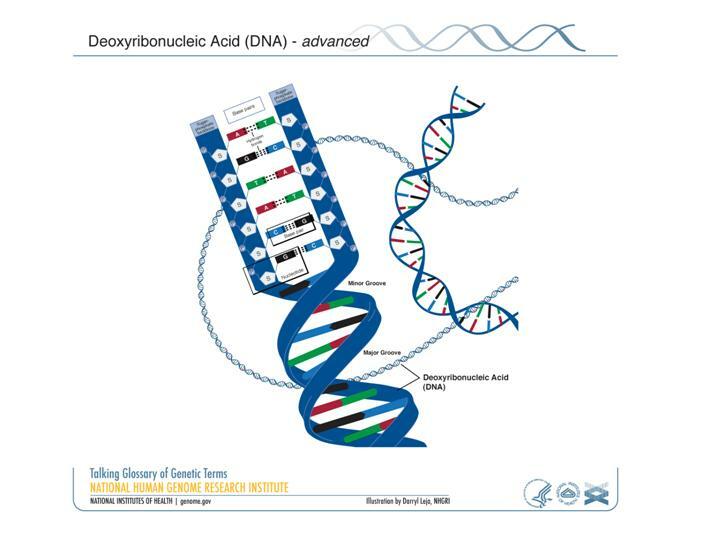 Deoxyribonucleic acid (DNA) is the material substance of inheritance. All cellular organisms use DNA to encode and store their genetic information. DNA is a chemical compound that resembles a long chain, with the links in the chain made up of individual chemical units called nucleotides. The nucleotides themselves have three components: a sugar (deoxyribose), phosphate, and a nucleobase (frequently just called a base). 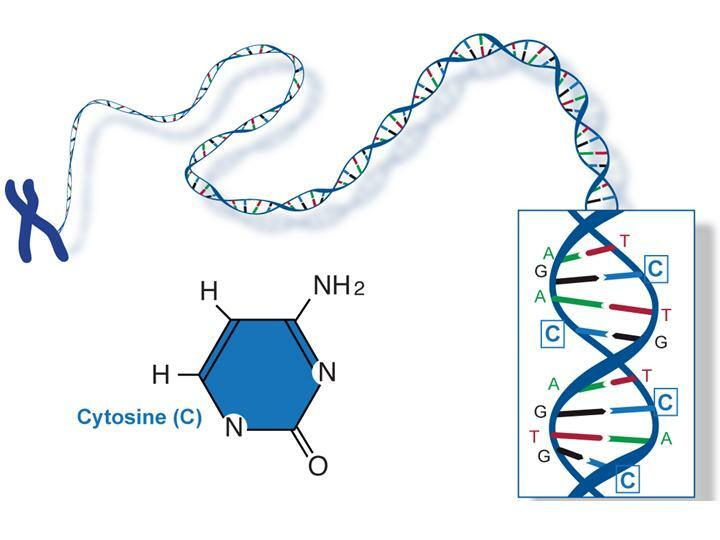 The bases come in four chemical forms known as adenine, cytosine, guanine, and thymine, which are frequently simply abbreviated as A, C, G and T. The order, or “sequence”, of bases encodes the information in DNA. 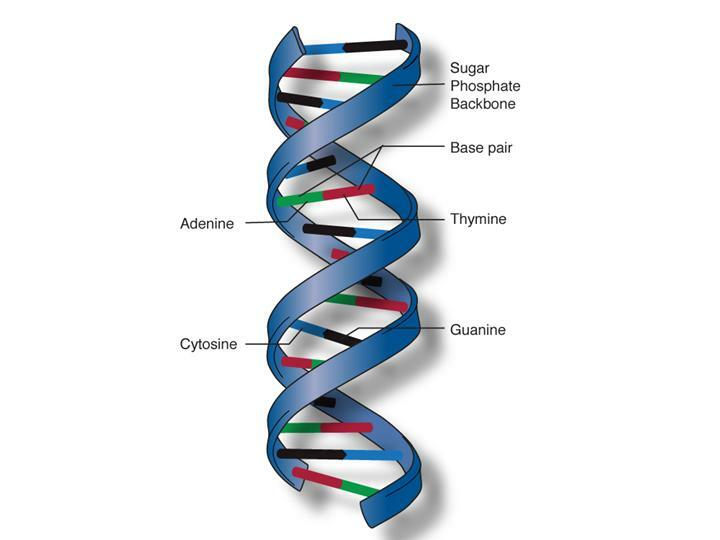 All living organisms store DNA in a safe, stable, duplex form: the famous “double helix”, in which two chains (also known as strands) of DNA wrap around each other. The two DNA strands are arranged with the bases from one lining up with the bases of the other. The sugar and phosphate components run up the outside like curving rails, with the matched bases forming ladder-like rails in the center. (Note – some viruses have their genetic material in the form of a single strand of DNA). The shape and charge of the bases cause A to bond weakly to T, and C to bond weakly to G. The bases from one strand of a DNA helix are in essence a mirror image of the bases in the other strand – when there is an A in one strand there is a T in the other; when there is a C in one strand there is a G in the other. These “base pairing” rules are the key to understanding how DNA carries information and is copied into a new DNA strand (a cell must copy its DNA before it divides into two cells). 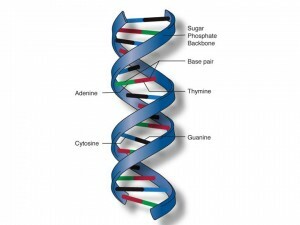 When organisms copy their genomes, enzymes separate the two strands of the double helix, pulling apart the paired bases. Other enzymes start new DNA strands, using the base pairing rules to make a new mirror image of each of the original strands. Mistakes in this process can lead to mutations (changes in the genomic sequence between generations). Many organisms possess error checking mechanisms that scan through the newly replicated DNA for mistakes and correct them, thus greatly limiting the number of mutations that arise due to replication errors. DNA holds information, but it generally does not actively apply that information. DNA does not make things. 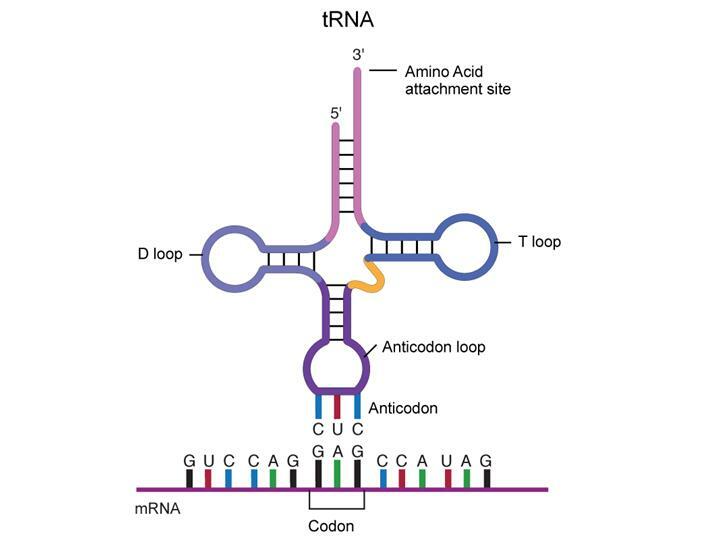 To extract the information and get it to the location of cellular machinery that can carry out its instructions (usually the blueprints for a protein, as we will see below) the DNA code is “transcribed” into a corresponding sequence in a “carrier” molecule called ribonucleic acid, or RNA. 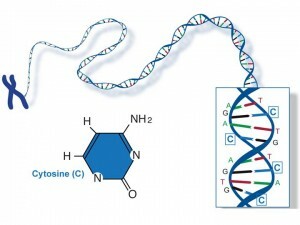 The portions of DNA that are transcribed into RNA are called “genes”. 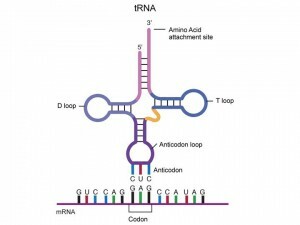 RNA is very similar to DNA. It resembles a long chain, with the links in the chain made up of individual nucleotides. The nucleotides in RNA, as in DNA, are made up of three components – a sugar, phosphate, and a base. The sugar in RNA is ribose instead of the more stable dexoyribose in DNA, which helps to make RNA both more flexible and less durable. 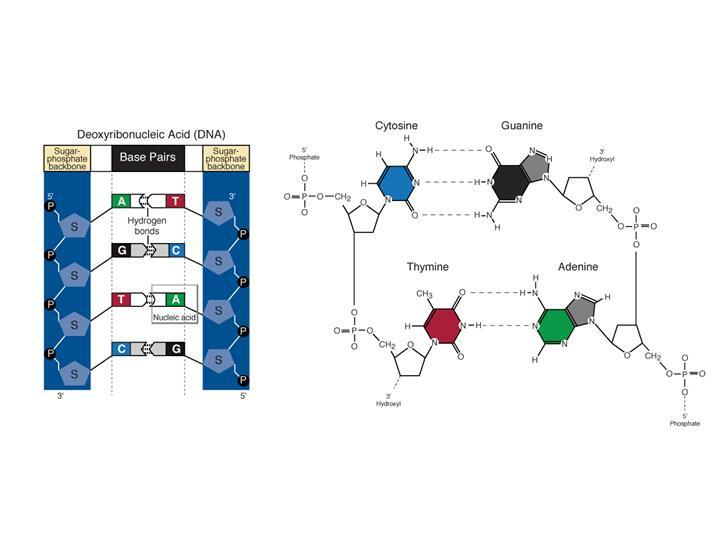 As in DNA, in RNA the bases come in four chemical forms, and the information in RNA is encoded in the sequence in which these bases are arranged. As in DNA, in RNA one finds adenine (A), cytosine (C), and guanine (G). However, in RNA uracil (abbreviated U) takes the place of thymine (T) (the switch allows RNA some special properties that we won’t go into here, at the cost of making it less stable than DNA). Cells make RNA messages in a process similar to the replication of DNA. 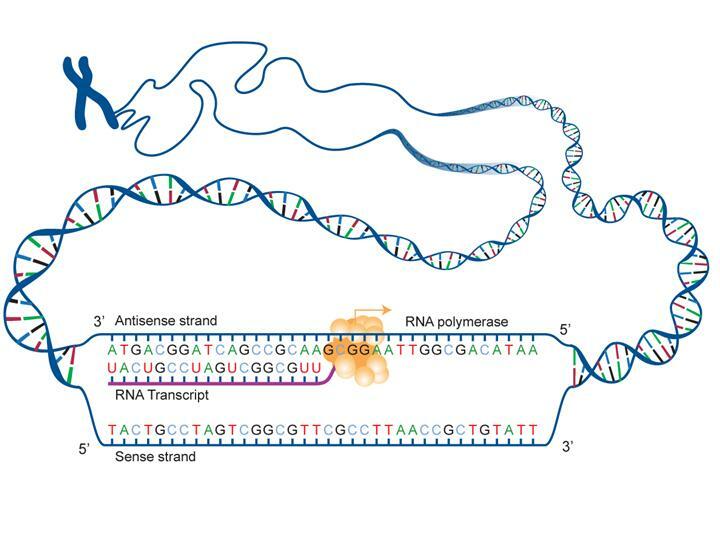 The DNA strands are pulled apart in the location of the gene to be transcribed, and enzymes create the messenger RNA from the sequence of DNA bases using the base pairing rules. 3. RNA molecules made in a cell are used in a variety of ways. For our purposes here, there are three key types of RNA: messenger RNA, ribosomal RNA, and transfer RNA. 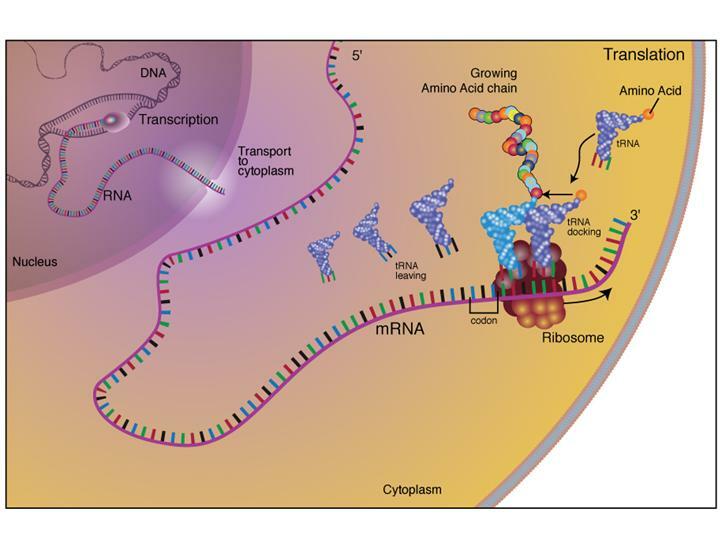 Messenger RNA (mRNA) carries the instructions for making proteins. Like DNA, proteins are polymers: long chains assembled from prefab molecular units, which, in the case of proteins, are amino acids. A large molecular machine* called the ribosome translates the mRNA code and assembles the proteins. Ribosomes read the message in mRNA in three letter “words” called codons, which translate to specific amino acids, or an instruction to stop making the protein. Each possible three letter arrangement of A,C,U,G (e.g., AAA, AAU, GGC, etc) is a specific instruction, and the correspondence of these instructions and the amino acids is known as the “genetic code.” Though exceptions to or variations on the code exist, the standard genetic code holds true in most organisms. Ribosomes are found in all cellular organisms and they are incredibly similar in their structure and function across all of life. In fact, the extreme similarity of ribosomes across all of life is one of the lines of evidence that all life on the planet is descended from a common ancestor. *Biologists often refer to proteins, especially large complexes of proteins, that move, turn, lever, or generally use energy to perform work, as “machines”. Biologists do not mean to imply that such molecules are designed. “Machine” is a useful metaphor for such functions, and simpler and more illuminating than “complex of large molecules that translates chemically stored energy into moving parts”. 4. Ribosomes make proteins using ribosomal RNA (rRNA). The ribosome reads the instructions found in the messenger RNA molecules in a cell and builds proteins from these mRNAs by chemically linking together amino acids (these are the building blocks of proteins) in the order defined by the mRNA. Messenger RNA molecules are longer than the encoded protein sequence instructions, and include instructions to the ribosome to “start” and “stop” building the protein. Within any particular organism, there can be hundreds to thousands to tens of thousands of distinct mRNAs that lead to distinct proteins. The diversity of form and function in organisms is determined in a large part by the types of proteins made as well as the regulation of where and when these proteins are made. The ribosome that converts mRNA into proteins is large and complex. It has more than fifty proteins (the exact number varies by species) in two major subunits (known generally as the large and small subunit). In addition to proteins, each subunit includes special RNA molecules, known as ribosomal RNAs (rRNA) because they function in the ribosome. They do not carry instructions for making a specific protein (i.e., they are not messenger RNAs) but instead are an integral part of the ribosome machinery that is used to make proteins from mRNAs. 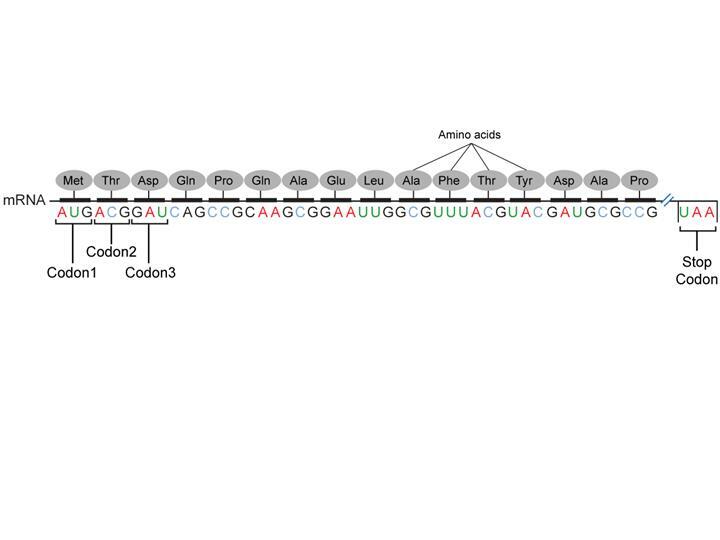 For more information on ribosomal RNA, see here. For information on how we use ribosomal RNA sequences in evolutionary studies, and environmental sampling go here. All figures are copyright free from the NHGRI “Talking Glossary of Genetic Terms”.